The theme for this month is Christmas. In our Stampin’ Up! Autumn/Winter catalogue there are loads of wonderful products from stamp sets, dies, punches and embellishments. I love using stamp sets and punches as these are ideal for the customer who has to watch the pennies and does not have a Big Shot. 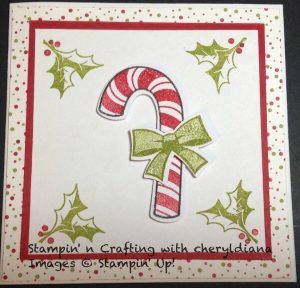 For this Blog Hop I decided to use the Candy Cane Season stamp set with the matching punch to make a 10 cm x 10 cm card which could be used as a card or as a gift label. As the theme is Christmas I chose to use Real Red and Old Olive ink as these colours fit in with the Christmas theme and matched the Designer Series Paper I was using. Here is my card which can easily be made by any level of stamper. As you can see I have chosen a Whisper White card base. I cut a 9.5 cm x 9.5 cm piece of DSP from the Under the Mistletoe DSP. This I then stuck to the card base. I then cut a 8.5 cm x 8.5 cm piece of Real Red card and stuck this onto the DSP. I stamped holly and berries into each corner of a 8 cm x 8 cm piece of Whisper White card stock which was then stuck to the Real Red card stock. For the Candy Cane I first stamped the outline in Black Memento ink and then stamped the stripes in Real Red and punched it out. This was stuck to the middle of the stamped Whisper White card stock. To finish off the card I stamped the bow outline using Old Olive ink and then stamped the inside bow stamp using the 2nd generation technique where you first stamp of the ink onto scrap paper and then stamp where you want it to be. This gives a lovely toned effect to the bow. This was then punched out and stuck to the candy cane. I hope you like my simple Christmas card. You can make a few more and put them into out Baker Boxes to make a lovely gift. Please do leave comments as you hop around this month’s blog hop. Very cute idea…..you just have to love candy canes….don’t they just make Christmas perfect.